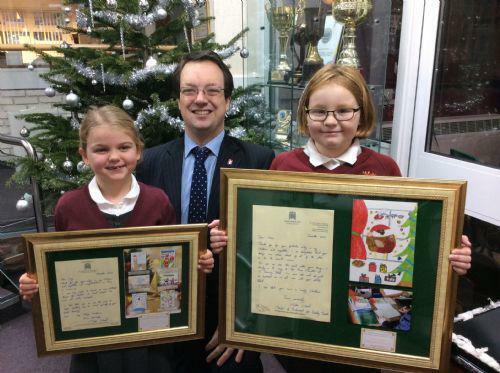 Two Maidensbridge children have won prizes in a special competition to design a Christmas card for our local MP. Alex and Lucy entered the competition, along with a number of children, to design a Christmas card for Mike Wood MP to send to members of the community and political colleagues, including the Prime Minster Teresa May. Lucy won the runners-up prize with Alex being judged to be the overall winner. Both received a framed letter and a copy of their design during our assembly from Mike Wood himself. Both designs will also be displayed in the Merry Hill Centre over the Christmas period.